In this post, we will leverage the custom service application infrastructure and solution we put together in the last 4 posts to enhance the service application with new features and capabilities. The sample feature we will add is an integration between SharePoint and MailChimp, enabling sites to synchronize a contacts list to a MailChimp list. The focus in this series has been to show how the SharePoint Service Application Framework (SAF) can be a very useful framework for adding capabilities to a SharePoint farm, in a centralized, reliable, and scalable way. Because SAF remains an integral part of SharePoint 2013, investments in SAF development remain viable for future versions of SharePoint. 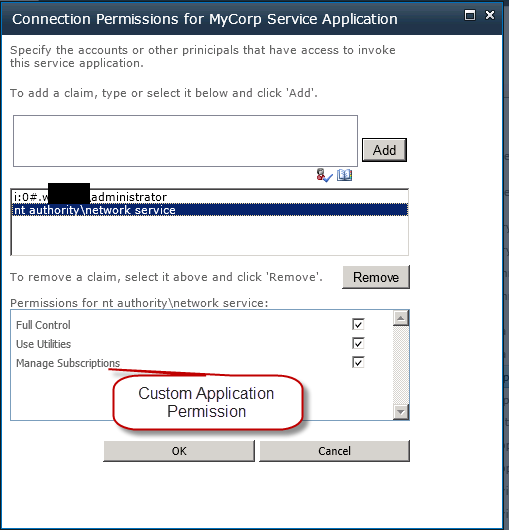 In this post, we will leverage the custom service application infrastructure and solution we put together in the last 4 posts to enhance the service application with new features and capabilities. The focus in this series has been to show how the SharePoint Service Application Framework (SAF) can be a very useful framework for adding capabilities to a SharePoint farm, in a centralized, reliable, and scalable way. In addition, because SAF remains an integral part of SharePoint 2013, investments in SAF development remain viable for future versions of SharePoint; which is one of the reasons why I felt this series might be of interest. As I was thinking about what I could do to showcase integrating new features and capabilities into a custom service application infrastructure, I felt that (going back to the 1st post in this series) showcasing an integration between an existing 3rd party system and SharePoint would be a good route to take. I landed on MailChimp, an email newsletter and publishing platform, while doing a google search last Thursday and started playing around with it a little. 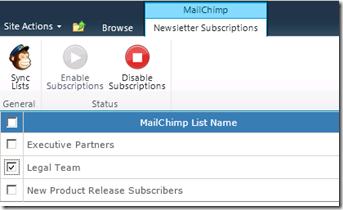 The next day, a client of mind asked me if I knew a good way to populate MailChimp from SharePoint, and this coincidence led me to selecting MailChimp for this final post, which I hope will tie up lose ends on the series. I think this is pretty comprehensive, and can be adapted to lots of different integration scenarios. You tell me if this integration succeeds at this or not, you be the judge. I had a lot of fun throwing it together these past couple evenings. Here are the use-cases for this integration that meet the above stated objective. Here’s how I went about it, with screenshots and code snippets. 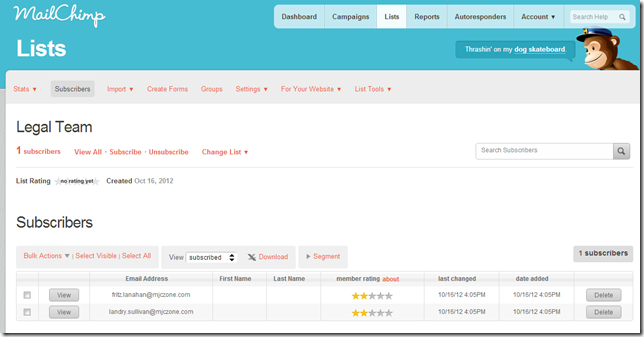 I decided to create a custom schema to house which MailChimp lists are enabled for community subscription, and also to track which contact lists are being published, and which newsletters they are being published to. 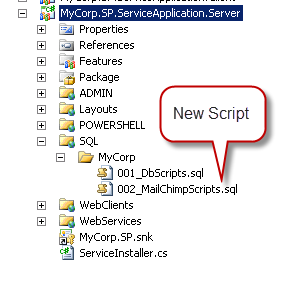 In order to add schema components to our existing database, all that we have to do in the infrastructure we built in the preceding posts is add SQL files to the SQL\MyCorp directory for them to be automatically processed during a service application update in the UI. Note, if a user is given the “Manage MailChimp” central admin right, that user automatically gets the “Manage Subscriptions” right. We do this by leveraging the override capabilities already built in the previous posts. 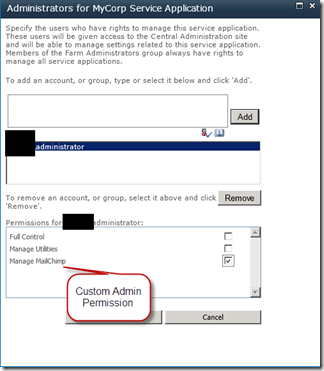 Farm administrators also automatically get all rights in our service application. The following is a sample for one of the methods. As you can see the implementation of the service talks directly to our custom schema we created earlier and also requires the proper security rights be met. 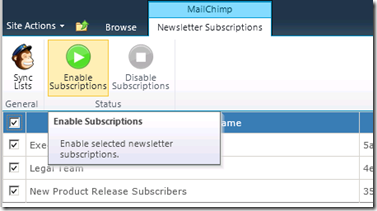 The conversation between SharePoint and MailChimp is done using RESTful calls with JSON. 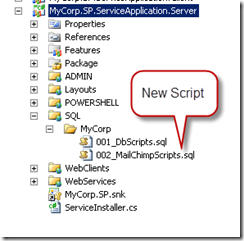 I use the ServiceStack.Text library in this example to do the client work. I actually added a couple methods to the open source library and compiled it usint .NET 3.5. The compiled DLL is included as a download at the end of this post. Added a new MailChimp section in our custom service application management page, as well as a Timer Jobs section which links directly to a filtered view of all the jobs that are part of the service application. 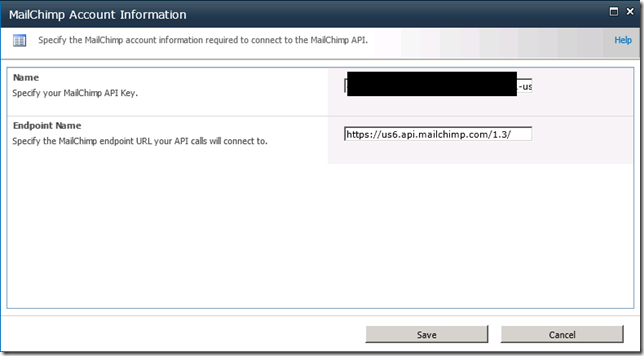 When clicking on the “Account Information” link, this gives the MailChimp administrator the ability to enter the API key and endpoint information needed to do the communication back and forth between MailChimp and SharePoint. This data is stored in the database. 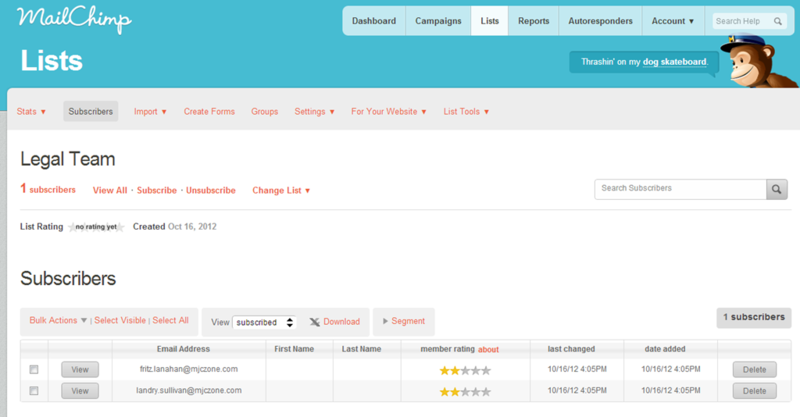 When clicking on the Manage Subscriptions page, I built a custom layout page to manage the MailChimp list subscriptions. 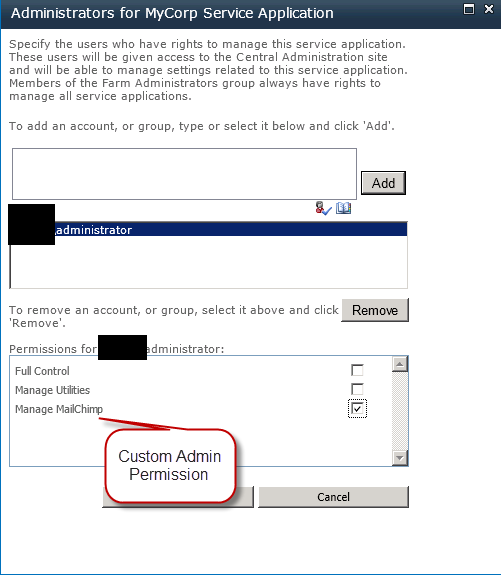 When the site admin clicks on the Manage Subscriptions button, he/she is presented with the option to pick from the “Enabled” newsletters in Central Admin. This UI is all done in AJAX, no postbacks. 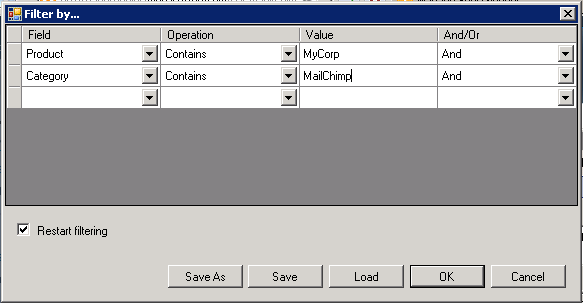 The process of synchronizing contacts lists over to MailChimp is done using a Job Definition. Back on the service application management page, click on “Review Job Definitions”. 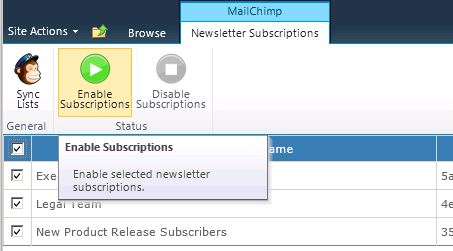 Now, select the MailChimp Synchronization Job and click on “Run Now”. The ULS logs will show the progress. 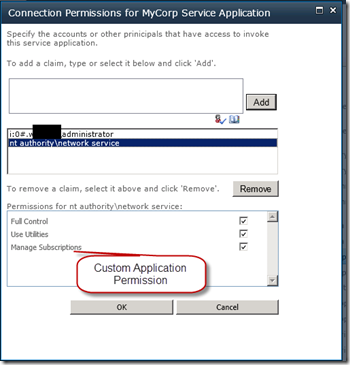 In this post, I attempted to show how once you have a custom service application infrastructure built, you can extend it easily by building add-on capabilities and features that can be managed centrally within your SharePoint farm, taking full advantage of what SAF has to offer. 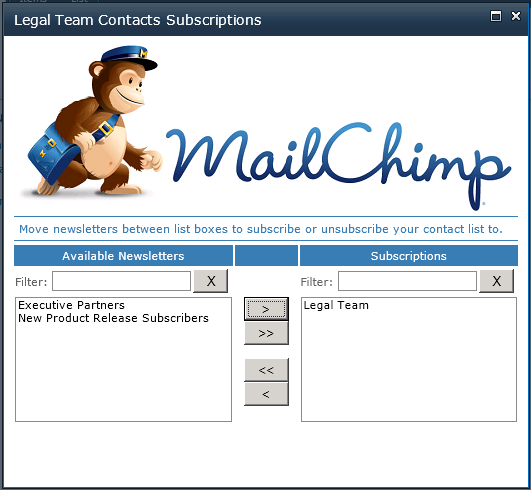 This MailChimp integration showcases the use of a custom service application, SharePoint jobs, a custom service application database, custom security, WCF, AJAX, scalability, and hopefully it paints a realistic picture of what can be achieved. Thanks for sticking with me through this series. Feel free to download the code and use it at your own risk , and please let me know what you think in the comments. Thank you very much for this great 101! Hey Thomas, glad you liked the series!